Hotels, retail shops and other businesses moving throughout the Washington, D.C. area know reliable furniture, fixture and equipment moving services are always available from Fitzgerald Moving & Storage. We have the experience and know-how to move even the largest piece of equipment or furniture with precision and care. 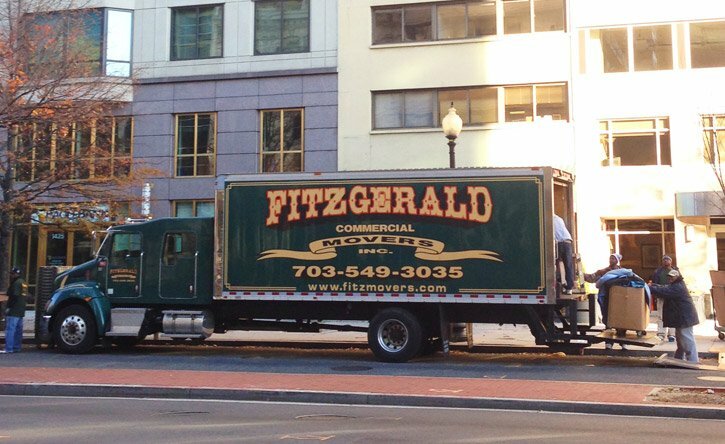 With over 35 years of moving experience in and around Washington, D.C., Fitzgerald Moving & Storage provides efficient furniture, fixture and equipment moving services. A Fitzgerald Moving consultant creates a plan to manage every detail to keep moving day on schedule and on budget. Highly trained movers arrive on moving day with all the carts, riggings, crates and gear to carefully wrap, pack and move everything for hotels and retail businesses moving into any new location. Once loaded, every single piece of cargo is efficiently transported. Fitzgerald's professional vehicle operators maintain safe driving records to ensure every item on our trucks arrives in the same condition as which it was received. Your complete satisfaction is our top priority. Fitzgerald Moving & Storage also offers clients secure storage options for long term or short term needs. Our clean and climate-controlled facility has over 500,000 square feet of storage space in which to keep beds, desks, chairs, tables, appliances and other equipment. This is the perfect solution during hotel, restaurant and retail remodeling, renovations and relocations. Getting started is easy. Just complete the Get a FREE Quote form provided here or Contact Us. A knowledgeable member of the Fitzgerald moving team will contact you to discuss details and build a custom moving plan. Fitzgerald Moving & Storage has the experience to manage every detail of your move. We are the hotel, retail, furniture, fixture and equipment moving specialists.